This image, from a draft of Louisiana's 2017 Coastal Master Plan, estimates the total coastal land loss in three emissions scenarios if the state were to take no action to rebuild the coast. Higher emissions cause greater land loss because the atmosphere would warm more quickly, glaciers and ice fields would melt, and the Gulf would rise more rapidly. Louisiana’s crumbling coast would suffer devastating flooding and dramatic land loss, leading to mass evacuations within a few decades, if president-elect Donald Trump carries through with his pledge to pull the U.S. out of a global agreement to reduce greenhouse gas emissions. That was the consensus of three prominent researchers expert on Louisiana’s coastal crisis and the state’s plan to address it. They said there is little hope of keeping the Gulf of Mexico from swallowing Louisiana’s coast if the world’s second-largest emitter of greenhouse gases reneges on its promise. “The implications for coastal Louisiana would likely be devastating,” said Torbjörn Törnqvist, chairman of the Department of Earth and Environmental Sciences at Tulane University. Donald Boesch, a New Orleans native and president of the University of Maryland Center for Environmental Science, said U.S. withdrawal could lead to as much as 6.5 feet of sea-level rise by the year 2100, and many meters more in the next century. “In that case, the coast would be up against the bluffs at Baton Rouge,” he said. The warming atmosphere is causing seas worldwide to rise for two reasons: Water stored as ice on land is melting, flowing into the oceans and increasing their volume. And the world’s oceans are expanding as their temperatures rise. The accelerating rise has been recorded by tide gauges and satellite instruments. South Louisiana, which rests on former deltas of the Mississippi River, is among the most threatened landscapes because it is sinking at one of the fastest rates on the planet. River levees have blocked land-building sediments. Canals dredged for oil and gas wells have accelerated erosion. Nearly 2,000 square miles along the coast have become open water since the 1930s. The state has responded with a $92 billion, 50-year plan to save much of what is left. But those hopes are tied to rates of sea-level rise that assume greenhouse gases will be reduced. Engineers plan to use sediment from the river to keep coastal lands above sea level. But that supply is limited, so the higher the Gulf rises, the less land they can save. 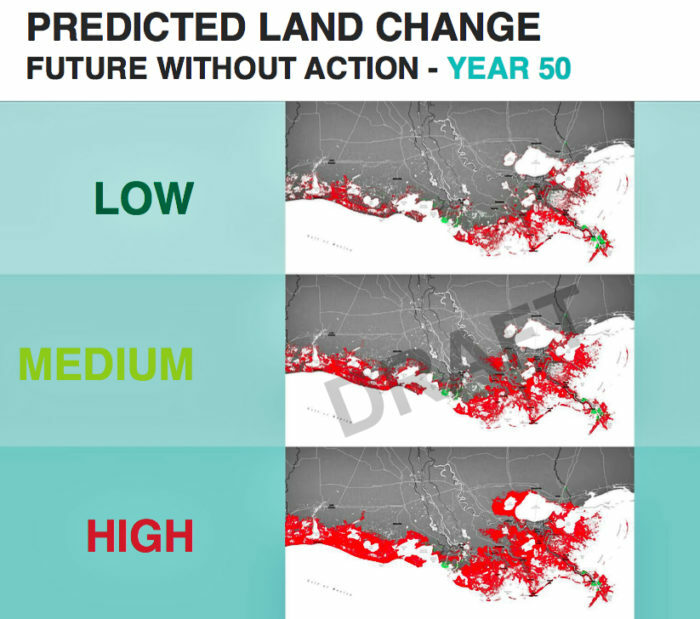 This image, from a draft of Louisiana’s 2017 Coastal Master Plan, estimates the total coastal land loss in three emissions scenarios if the state were to take no action to rebuild the coast. Higher emissions cause greater land loss because the atmosphere would warm more quickly, glaciers and ice fields would melt, and the Gulf would rise more rapidly. In April, President Barack Obama joined the leaders of 194 nations, including China and India, to sign an agreement in Paris to reduce emissions enough to prevent the earth from warming more than 2.7 degrees Fahrenheit by 2100. That, according to computer models, would keep seas from rising more than a meter, or 3.2 feet, by 2100. But if temperatures rise 3.6 degrees or more, ice sheets on Greenland and Antarctica could begin an unstoppable process of melting, resulting in as much as 6.5 feet in sea-level rise over the same period. That could inundate much of Louisiana coast. Those goals can’t be reached without reductions by the top three emitters of greenhouse gases— China, the U.S. and India. One research firm estimates that under the terms of the agreement, the U.S. would account for 20 percent of emissions reductions over the next 15 years. But the U.S. role is larger than its share of emissions. Boesch said if the U.S., the world’s wealthiest nation, backs out, that could lead other, less affluent countries to pull out as well. That would end any chance of meeting the worldwide emissions reductions needed. Boesch said the research clearly shows a tipping point at which accelerating sea level rise becomes unstoppable for centuries. “If we can reduce emissions enough to keep the temperature rise around 1.5 Celsius [2.7 degrees Fahrenheit], then we’ll still have sea-level rise into the next century, but it would be less than a meter, and manageable,” he said. Trump, like many Republican leaders, has denied the scientific consensus that humans have caused warming. He has said the research is a hoax and a plot by the Chinese government, and reducing greenhouse gases would be too costly to American industry. During his campaign he pledged to pull out of the Paris climate agreement and to roll back Obama administration regulations aimed at reducing emissions from power plants and other sources. Under the terms of the Paris agreement, it would take the U.S. almost four years to formally withdraw. But he could immediately halt changes to reduce emissions and lighten existing regulations. Some environmentalists believe his actions could be offset by technology changes that already have reduced industrial emissions in the U.S., as well as a shift underway from coal to natural gas, which has lower emissions. Trump’s agenda was part of the GOP platform and supported by many of its congressional leaders. That includes all GOP members of Louisiana’s delegation, each of whom has either said the planet is not warming or said they’re not convinced humans are the cause. Trump took 58 percent of the vote in Louisiana, winning most of the coastal parishes that have lost the most land and will be the first to deal with the rising Gulf of Mexico. Boesch and Törnqvist said the rapid increase of sea-level rise could turn some of those parishes to open water before the end of the century if Trump pulls the U.S. out of the Paris agreement. Climate scientists were among the first to react with concern to Trump’s election. The Lens reached out to three scientists with long histories of research on the Louisiana coast, climate change and sea-level rise. Boesch pointed to research published this week projecting sea-level rise under different scenarios of emissions for 138 coastal cities around the globe. New Orleans was listed as one of the most threatened. The rates in the most optimistic scenarios would be challenging to deal with, he said, and the state would have little chance to save its southern third if Trump follows through on his promises. Louisiana resident Virginia Burkett is associate director for climate and land-use change at the U.S Geological Survey and a co-author of international studies on sea-level rise. She was equally concerned. She said failure to reach the emissions goals set in Paris would not only expose coastal communities to rising seas, but also damage from tropical storms.